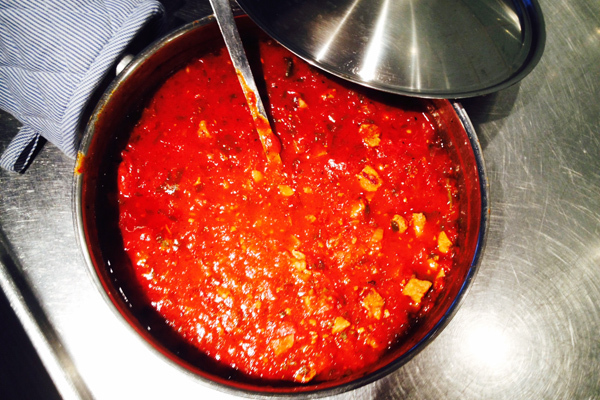 If you like meat sauces like Bolognese or Ragu’s with lamb you will love this. It takes almost no time to put together, most of the magic happens in the oven. This is a very easy and straight forward dish. You do need to rely on good quality tomatoes and don't leave out the parsley! 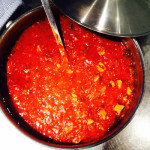 You can if you like add a bit of basil but stay away from the thyme it will change the character of the sauce. Begin by preheating the oven to 150C degrees. Take each slice of Karre (Blade Steak) and remove the bones. Take the meat and cut it into small bits about ½ cm square. Remove any large bits of fat and discard as you go. In a medium saute pan put 1 tbsp. olive oil and brown the bones well. When done remove the bones and set aside. Then take the cut meat and brown it well and set aside. Through away the excess fat in the pan. Take the same pan and saute the onion until they color a little. Then add the garlic and half the parsley and saute for a minute or two until you begin to smell the garlic. Remove from the heat. In a large pot that will go into the oven and that has a lid. Place all the bones, meat and sauteed vegetables. Deglaze the pan with the 2 dl, of water and add to the meat. In a small bowl take each can of tomatoes and crush them with your hands into a pulp and add to the pot. Using an empty can, fill it half way with warm water and rinse out all the cans with it and add to the pot. On the stove over a medium heat place the pot to bring all the ingredients up to a simmer. Add the salt, sugar and black pepper. Mix well and cover and bring up to a simmer. Place the pot in the middle of the oven to simmer gently for 1 to 1½ hours. When done remove the bones and discard. Taste for seasoning. Serve this with a Penne or Rigatoni and enjoy. This is going to give you more sauce than you can use for one dinner. It's great to freeze and use later. If you are like us (a household of 2) This should give you 2-3 dinners and a lunch for work. Karre is known as Blade Steak in America and is sold exactly the same way. With or without it's bone or whole pieces or sliced which is good for the barbecue. 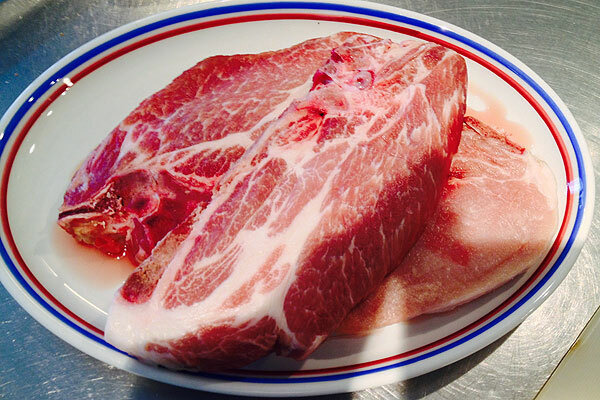 For this recipe it's useful to buy the meat in thick slices from the market. You should buy the type that still has its bone because it's this that really makes the sauce. Remove all the really heavy fat but you don't need to be really fussy. After you brown the bones you should toss out the fat and that saves you a bit of unnecessary caloric intake.